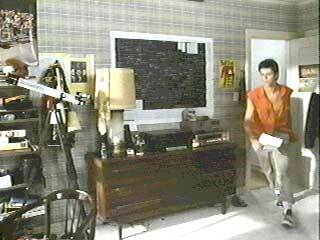 C. Thomas Howell wears black high top Converse “Chuck Taylor” All Stars in the film. Michael likes to hang out with Deborah and Toni. Secret Admirer is a comedy of errors revolving around an anonymous love letter placed in Michael Ryan’s (C. Thomas Howell) locker on the last day of school. Because he is in a hurry to leave school and catch up with Deborah Anne Fimple (Kelly Preston), who he has a crush on, and Toni (Lori Laughlin) who is his girl buddy, he doesn’t actually look at it. After school, Michael and his friends hang out at his house. One of his friends, Roger (Casey Sitmaszxo), grabs the letter and reads it out loud, surprising everybody, especially Michael. Because Michael has a crush on Deborah, Roger is able to convince him that she must be the girl that wrote him the letter, even though Deborah has actually been dating Steve (Scott McGinnis) an older fraternity boy at a local college. Michael and his friends decide to crash a fraternity party that night, where they know that Deborah will be. 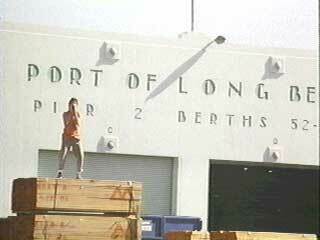 When Michael is finally able to get Deborah alone, he starts coming on to her by repeating the words of the letter. However, Deborah does not respond to Michael’s advances, and eventually he decides that she didn’t write the letter. Not knowing what to do, he goes to Toni for advice. She suggests that Michael write an anonymous letter to Deborah, since the one he received clearly had an impact. Michael writes two letters, and asks Toni to deliver them to Deborah because they are good friends. But his letters are so poorly written that Toni tears them up and rewrites them (without telling Michael) before giving it to Deborah. Michael can’t believe what he reads in the anonymous love letter. Meanwhile, the original letter starts to cause a whole series of mishaps. At the Ryan breakfast table, the letter is accidentally placed in Michael’s dad George’s (Cliff De Young) textbook for a business class he is taking from Deborah’s mom Elizabeth (Leigh Taylor-Young) at night school. Michael’s mom, Connie (Dee Wallace Stone), also sees the letter, and she thinks that he is having an affair with Elizabeth. When George discovers the letter at class that night, he thinks that Elizabeth wants to have an affair with him. Deborah’s dad Lou (Fred Ward) also discovers one of the letters that Michael wrote to Deborah, and thinks that Elizabeth is cheating on him. The four adults pair off in opposite couples, each thinking that the other is either in love with them, or cheating on their marriages. Deborah, however, is really impressed with the letters actually written by Toni that she received, and she starts dating Michael. When Michael is finally able to be with Deborah, he soon discovers that they are not compatible, and even though she makes a big deal about their relationship to all of their mutual friends, they eventually break up. Finally, all the mixups are resolved, and Michael figures out who his true Secret Admirer is. 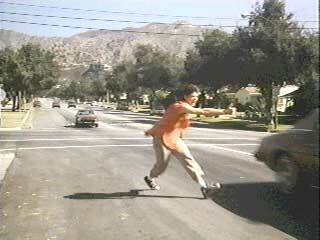 Michael desparately tries to flag down a car to pursue his secret admirer. Secret Admirer has a lot of plot twists and turns, as you would expect in a comedy of errors. It poses some interesting questions about our times and morality, but the eventual message we get is that true love wins out, even in the face of serious temptations. You never really have any doubt that things will eventually be worked out, and with all the main characters present in the film being so closely related, it seems a little contrived, but if you approach it as a light comedy, it is an enjoyable entertainment. Let’s get together at the next pier! Michael hooks up with his secret admirer at last. There are only two real chucks scenes in Secret Admirer: one at the beginning when Michael is leaving school and chasing after Deborah and Toni, and at the end of the film when he finally figures out who his secret admirer is. In both scenes you see Michael putting his chucks through some paces, running, climbing, and jumping in a lot of quick-edited sequences. 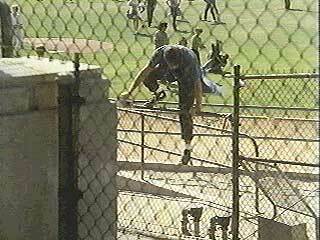 Michael scales the school fence in record time so he can hang with Deborah and Toni. Secret Admirer. (1985) C.Thomas Howell, Lori Loughlin, Kelly Preston, Fred Ward. Directed by David Grenwalt. Categories: Drama, Romance, Teenagers.